SCIENTIFIC NAME: Order Arachnida, family Trombiculidae, Trombicula spp., Entrombicula spp. IDENTIFICATION: Microscopic animals related to ticks and spiders. Larvae are bright red. 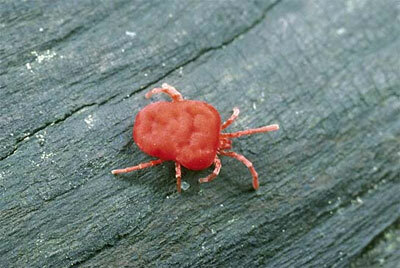 Photo of a chigger, Trombicula spp. Photo by: Department of Entomology and Plant Pathology, Auburn University. 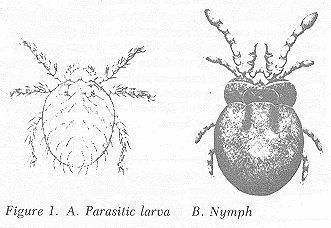 BIOLOGY AND LIFECYCLE: Nymphs hatch in the spring and are parasites on humans and animals. They inject a digestive juice that dissolves skin cells so they can be more easily eaten. Affected skin will redden and swell. Their numbers are the highest in mid-summer. The adults feed on insects. HABITAT: Grasslands and weedy unirrigated areas. FEEDING HABITS: Nymphs attach to skin of various animals to feed. ECONOMIC IMPORTANCE: Cause severe itching and small reddish welts on skin. NATURAL CONTROL: Increased soil moisture. Some researchers say chiggers have no natural enemies. That may be true, but the imported fire ants will certainly eliminate them. ORGANIC CONTROL: Sulfur dust is a good repellent. So is lemonmint, also called horsemint (Monarda citriodora). Both can be used on the body and on the site. Spraying the essential oil products can help and dusting dry garlic, cinnamon and/or cedar can also help Take a hot, soapy bath to remove larvae. Stop the itching with baking soda, vinegar, aloe vera or comfrey juice. INSIGHT: If you have to walk through property that's dry and weedy and it's summertime, take a few precautions. First, don't wear shorts. Second, dust your shoes, pant legs, and socks with powdered sulfur. It's available at any nursery or feed store. Rubbing the crushed flowers of lemonmint on your clothing will also repel chiggers. Chiggers can be controlled with a broadcast application of diatomaceous earth or an application of granular or dusting sulfur at 5 pounds per 1,000 square feet. If you have alkaline soil, the sulfur is also a good soil amendment. If you have acid soil, just don't overdo it. Excess sulfur will kill or severely imbalance the microorganisms in the soil. If your property is watered occasionally, chiggers won't be a problem. We know one outdoorsman who swears that if you don't wear underwear or socks, the chiggers won't have a place to hide and won't bother you. Treat infested sites with elemental sulfur at 5 pounds per 1,000 square feet. Chiggers like dry infertile soil. Increase the organic matter and the water holding capacity of the soil and the pressure from these mites will be minimal. Lava sand or other volcanic material will help the soil’s moisture retention. Apply baby oil to your body before dressing if you plan to be in infested area. A: Try elemental sulfur on the site at 5 lbs. per 1,000 square feet. or other orange oil-based product. Treat your bites with full strength orange oil, vinegar or comfrey juice fresh from the stems of the plants. Q: I saw your suggestions about repelling chiggers and want to share with you how I handle them. Tea tree oil works well as a repellent, but I don't like the fragrance, so I tried lemon-scented tea tree oil (the plant's scientific name is Leptospermum petersonii. This is the main ingredient in SkeeterBeater, a blend of essential oils. I don't use the spray and get insect bites, I dab them with a plant-oil product called Helichrysum italicum, also bought from Nature's Gift. After a few minutes, the itching goes away. If the itching starts again after a few hours, I dab the bites again. A.H., La Crescenta, Calif.
A: Thanks for the tip. Although I haven't tried this, it sounds reasonable.